This past weekend was my second time at Blend and just like the first time, it was very enjoyable. We chose to order differently this time by choosing traditional entrees instead of an all tapas meal. While I love tapas, I wanted to try their main dishes to see which route I preferred. After a lovely meal, I have to say that I'm partial to the traditional entrees - they were scrumptious. 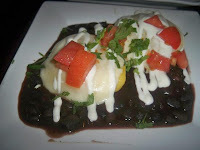 Sopes - We started out with these sweet corn cakes that looked like mini arepas. Topped with cheese, tomato, onions and black bean sauce, they were a nice, savory way to start a meal. It was a bit chilly outside and these were a great way to warm up, especially since the black bean sauce had spice to it. This app was ideal for two people. 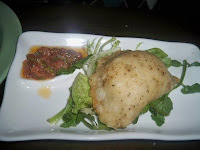 Carne Empanada - Dan and I both love these little pastry pockets filled with hearty ingredients, and for ours, we chose it to be filled with braised beef short ribs. The beef was tender and just like the sopes, it was slightly spicy from the picadillo sauce. I liked the outside pastry shell but thought that it could've been a bit more golden brown. Ropa Vieja - This was my entree and it came recommended by our server. 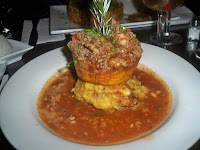 As you could see from the above picture, the presentation was impressive - the ropa vieja (shredded beef) was served in a crunchy plantain cup and was carefully positioned on a beautiful mound of mashed plantains. I loved pairing the sweet plaintains with the salty bite from the shredded beef. The entire structure rested in a gorgeous--and once again, slightly spicy--tomato broth. If you're a meat lover, I highly recommend this. 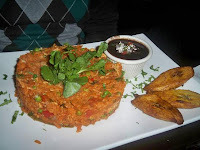 Arroz con Pollo - Although this sounds like the most basic dish on the menu, it was anything but. Actually I preferred it to my ropa vieja and would like to get it next time. What I liked about it is that they took the meaning of arroz (rice) con pollo (with chicken) literally, as they placed pieces of oven roasted chicken into flavorful yellow rice, and mixed it with peas, corn and cilantro. It reminded me of Spanish risotto, which is lovely. Even though I didn't think it needed this, there were three sweet plaintains resting on the plate as an extra special touch. We were quite happy with our server. He was knowldeable about the menu and helped me decide on my ropa vieja dish. He cared about service and came to check on us a couple of times without being too intrusive. I liked his style, which was attentive but not overwhelming. Costs remain very affordable, and for two appetizers, two entrees and two alcoholic drinks (we got sangria), the bill was $55 excluding tax and tip. Also, as mentioned earlier this week, Blend is running a couple of great holiday specials Mondays - Wednesdays. Check them out here. You're welcome - it is sooo good. I highly recommend the arroz con pollo. Enjoy! I also was there for dinner on Saturday w/a friend. As always, it was delicious. My friend had the pernil - which was so tender and delicious. It was her first time trying pernil! You must try the homemade empanadas and of course my favorite the Sangria!! It's reasonably priced and the waiters are attentive and pleasant. We live around the corner and have been there once. The first time the service was so bad (menus thrown on the table, waiting 15 minutes for water and then another 30 minutes for coffeet that never came), so we left. Ironically enough, so did three other tables of people, which we only know b/c we all staggered into lounge 47. I can't comment on the food b/c we never actually got any of it, but the service and wait were so terrible, we will never go back. In speaking with our neighbors, they all had an experience similar to ours, and those that actually received the food that they ordered were unhappy with the quality. You must have just caught them on a day when the stars were aligned.